Footballer Clubs: Celtic, Morton, Partick Thistle. A Lisbon Lion, Stevie Chalmers will best be remembered in Scottish football history for scoring Celtic’s winning goal in the European Cup Final of 1967. He signed from Ashfield Juniors in 1959, making his first team debut soon afterwards away to Airdrieonians in a League match. A fast and unselfish centre forward, Stevie could also score goals and netted 228 times in 405 games. He enjoyed a long association with Celtic lasting 12 years and remains the club’s fourth highest all time goal scorer. 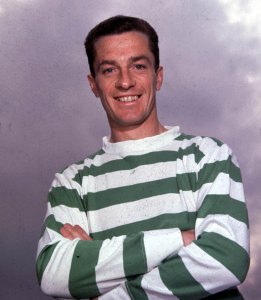 Even though Chalmers suffered a bad injury during the League Cup Final in 1969 he nevertheless would win four League Championships, four League Cups, three Scottish Cups and the European Cup with Celtic. On leaving Celtic in 1971 Stevie would go on to play for Morton and Partick Thistle. At international level he scored three goals in five games for Scotland, one of the goals coming in a 1-1 draw against Brazil, who were the then reigning world champions and were led by Pele.